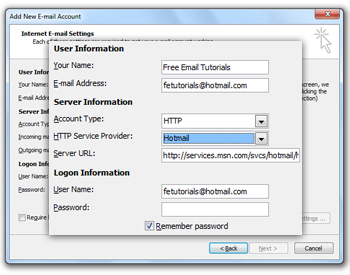 To setup Hotmail in Outlook as a regular POP3 account, please see our Hotmail POP3 settings tutorial. If, however, you do own a copy of Outlook 2003 or Outlook 2007, read on, since you will be able to check your Hotmail emails with what is essentially full IMAP support. There are some minor limitations if you do not subscribe to the Hotmail Plus service, but none that prevent you from checking your Hotmail account from Outlook. Click on the New button; as email account type, choose "Microsoft Exchange, POP3, IMAP, or HTTP" and click Next. In Outlook 2007, check the Manually configure server settings or add additional server types checkbox, and click Next. On the next screen, select Internet E-mail (as opposed to Microsoft Exchange), and click on the Next button to fill in your email account information. You are now nearly ready to check your Hotmail emails from the comfort of Outlook. Note that you may need to scroll a long way, depending on the number of email folders you have, to find your Hotmail account; it will be automatically called after your Hotmail email address, making it easy to identify, especially if you end up setting up multiple Hotmail accounts in Outlook. The next step is to download and setup Outlook Connector: checking your Hotmail emails, trying to update your folder listing, etc. will return a connection error until you do. Let's move on to the Outlook Connector.